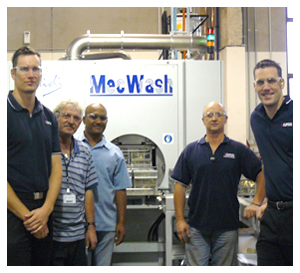 The benefits of component cleaning using aqueous-based technology from MecWash Systems Ltd., within the context of Trichloroethylene (TCE) replacement, have now been recognised with a major national award in Australia. The installation of a 'Midi' unit from the company has helped Clipsal Australia Pty Ltd. (part of the Schneider Electrics Group) to win the National Safety Council of Australian (NSCA) Award within the category of 'Best Solution of an OHS&E Specific Workplace Risk'. The achievement follows the company's receipt of a Certificate of Commendation in the 'Injury Prevention, over 500 Employees' category of the Self Insurers of South Australia (SISA) Awards and, significantly, has been built on the environmental benefits offered by the MecWash design. Component cleaning to remove pressing lubricants, machining oils and metal particles is a vital operation in the production process at Clipsal's Wingfield plant, one of the country's leading manufacturers of electrical switchgear. Whilst solvents have previously been used to address this requirement, the company reports safety, environmental and performance improvements as a result of the switch to aqueous technology. Independent tests, it points out, have shown improved results as a result of the MecWash installation. Proud winners of the National Safety Council of Australia Award - the winning team from Clipsal Australia Pty Ltd. (part of the Schneider Electrics Group) with the MecWash Midi component cleaning installation that has played a key role in the achievement. Photograph shows, from left to right, Damian Allen, Duncan Hurst, Shamsheer Shaik, Michael Barlow and Brett King. A key element of Clipsal's submission for both awards was centred on the acknowledged risks of the use of TCE and how these were addressed by the MecWash solution. It pointed out that a risk assessment on the option to continue using TCE identified some 21 high risks and concluded it was neither morally nor economically justifiable to continue with the practice. This view reflects the organisation's continual commitment to reducing risk across its business - a process supported by regular liaison with HSE representatives, relevant supervisors and team leaders at the Wingfield premises. Specifically, four key criteria were identified as part of the process to replace TCE. The new method should be safer for employees, it should not damage, rust or leave any residue that has a detrimental effect on metal parts or plastics, it should clean to a set standard and it should be cost effective - all requirements that are met by the use of the MecWash Midi at the site. "Clipsal has drawn attention to a number of key benefits resulting from the use of the Midi and our MecWash AC32 cleaning chemical," comments John Pattison, Managing Director at MecWash Systems. "In particular, a reduction in the risk of swarf-related injuries, safer handling of tote bins, an elimination of rumbling operations and a reduction in power usage have all been noted," he explains. "At the same time, the decision has eliminated the risk of solvent seepage to ground water - which is of particular relevance in a country where minimising water consumption and pollution is critical." The MecWash installation has included two turnover units that see bins of parts emptied and then themselves cleaned. Additionally, an Aqua-Save 30 from the Aqua-Save Technologies Division of MecWash Systems is used alongside the Midi and the recycling of waste wash water has dramatically reduced the need for disposal off-site. "These awards are highly regarded achievements of which both Clipsal and, indeed, MecWash Systems are extremely proud," continues John Pattison. "We believe the installation provides an important demonstration of our equipment and technology making increasing inroads into worldwide markets by offering benefits that are acknowledged internationally. It builds on a growing list of successes, both in regions such as the Far East and, indeed, closer to home in Europe - we have, for example, recently participated successfully in the 'Parts 2 Clean' exhibition in Stuttgart, Germany. "We offer our sincere congratulations to Damian Allen and his team at Clipsal, and wish them further success in delivering both production and environmental benefits from the use of our aqueous cleaning technology," he concludes.